The worldwide market size for human machine interface market is estimated to be USD 3.64 billion in 2017 and is estimated to grow at a CAGR of 14.5% during the forecast period. 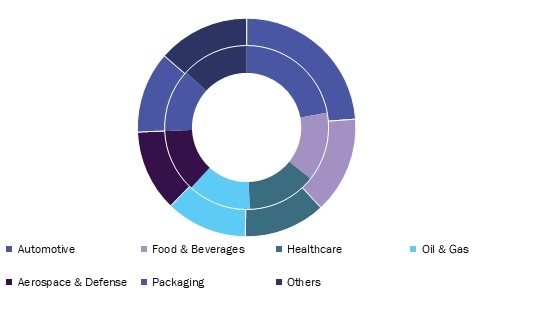 The growth in the adoption of industrial automation by the manufacturing sector worldwide is the prime factor fueling the human machine interface market growth. Furthermore, the integration of products with analytics software to enhance productivity and quality is another factor driving the human machine interface market growth. However, high installation cost is expected to act as a hindering factor. The HMI industry has experienced various advancements in technology from Light Emitting Diode indicators to fully functional touchscreen as well as graphic oriented terminals. Also, WiFi and Bluetooth integration has further enhanced device mobility that is expected to propel demand for human machine interface during the forecast period. The global human machine interface market is segmented on the basis of products, end users and geography. By product, the human machine interface market for display terminals is expected to dominate. With the advancements in technology, the CRT-based displays have been replaced by innovative TFT based displays. Additionally, LCD and LED based UHD displays are also expected to attain a high adoption rate during the forecast period. The automotive end-user industry is anticipated to hold the largest market share in the human machine interface market. The implementation of innovative technology in the automotive industry has transformed the dashboard layout of cars to more dynamic, flexible, and adaptable design. These standalone systems offer better safety with the integration of speech system with HMIs. Also, the healthcare and aerospace & defense sector is experiencing high adoption of HMIs. The growing application of HMI in unmanned vehicles and cyber security is propelling the market growth of aerospace & defense industry. The North America is currently leading region with the largest market share in the global human machine interface market. The region being an early adopter of technology is the key factor influencing the human machine interface market market growth. Also, increase in automation projects is anticipated to fuel the growth of HMI market in North America. However, the HMI market of Asia Pacific is witnessing a high growth with rapidly growing industrialization in the developing economies. The players operating in the market emphasize on developing products with innovative technologies for both displays and processors with an aim to develop efficient solutions for specific applications. Also, mergers and acquisitions is the key strategy adopted by these players. The complexity of managing huge database volume by manufacturers has resulted in seeking for development of advance systems to gain competitive advantage. The shifting preference towards digital panels over traditional systems is anticipated to propel the human machine interface market growth globally. Some of the major players operating in the human machine interface market include ABB Ltd., Eaton Corporation, Siemens AG, Emerson Electric Co., Honeywell International Inc., Yokogawa Electric Corporation, Rockwell Automation Inc., Mitsubishi Electric Corporation, American Industrial Systems Inc. and Schneider Electric SE among others.